The Red Spotted Goby, Trimma rubromaculatus, is a beautiful, rare fish that comes to us from the reefs of Cebu. 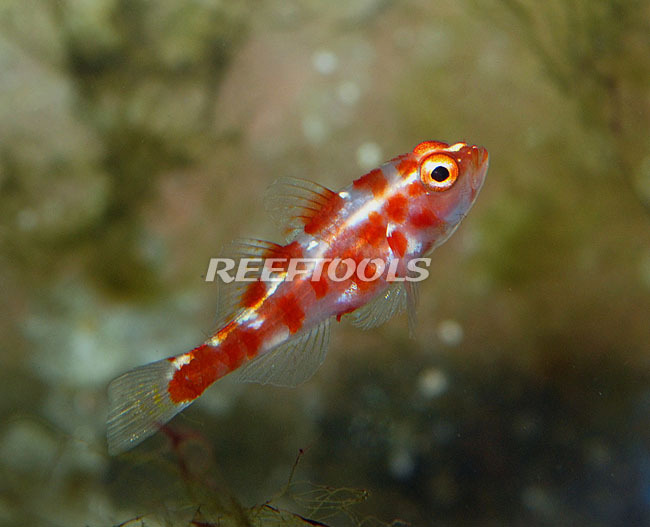 This smaller goby has an opaque body, with irregular red spots. The eyes of the Red Spotted Goby are large for it’s size, and are speckled in red and gold. This goby is quite active and a very peaceful tank mate, appropriate for any reef or fish only tank. This species requires a tank with plenty of live rock, creating numerous hiding spots and providing a food source. Pairs, or smaller groups, tend to do better as long as they are all introduced simultaneously. This species of gobies is not a suitable tank mate for larger, aggressive fish and invertebrates. The Red Spotted Goby‘s diet should consist of a variety of frozen foods, brine shrimp and mysis shrimp.